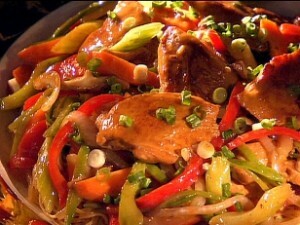 Chicken Vegetable Mix recipe by Nazish Aman Ullah at DesiRecipes.com. Wash all the vegetables (tomatoes, onions and capsicum) and cut into 1" square pieces. Cut the bone less chicken into 1" square pieces. Heat the oil in a pan and add chicken pieces. Fry them on low to medium heat until cooked and tend to become pink or golden. Keeping these pieces aside, add the garlic paste to the same oil and heat it until pink. Then add soya sauce, salt , pepper, sugar and vegetable pieces and mix with chicken . Add three or four Tbs of water. Now turn the flame dim and cover the pan and leave it for 20 min to make the vegetables tender.